This article was originally published in the Winter 2017 edition of the League's Bicycle Friendly America magazine. When people first think of a Bicycle Friendly Community, their first thought probably isn’t a remote island town in the rainforest of Southeast Alaska where it frequently rains more than 100 inches a year and gets dark by 3:30 p.m. during the winter. But Sitka, Alaska, first earned a Bronze level Bicycle Friendly Community (BFC) designation in May 2008 and in May 2016 it moved up to the Silver level. A commercial fishing and tourist town of 9,000 residents located on Baranof Island in the middle of the Tongass National Forest, Sitka is the first Alaska community to earn a BFC designation. Since then, Anchorage (Silver) and Juneau (Bronze) joined the program, and this fall, Fairbanks received an honorable mention. Sitka also is the only Alaska town with a Bronze level or higher designation in the Walk Friendly Communities program. Sitka’s becoming a Bicycle Friendly Community can be tied to the inaugural Sitka Health Summit in April 2007, an event co-sponsored by Sitka Community Hospital and the SouthEast Alaska Regional Health Consortium (SEARHC, pronounced “search,” the regional tribal health nonprofit that works with Alaska Native patients). During the Sitka Health Summit, residents gathered to decide on a few community wellness projects for the next year, and that year they chose becoming a bicycle and pedestrian friendly community. “There has been a marked increase in bicycle riding in Sitka since first becoming a Bicycle Friendly Community in 2008,” said Mim McConnell, Sitka’s mayor from 2013–16 and an occasional bike commuter. 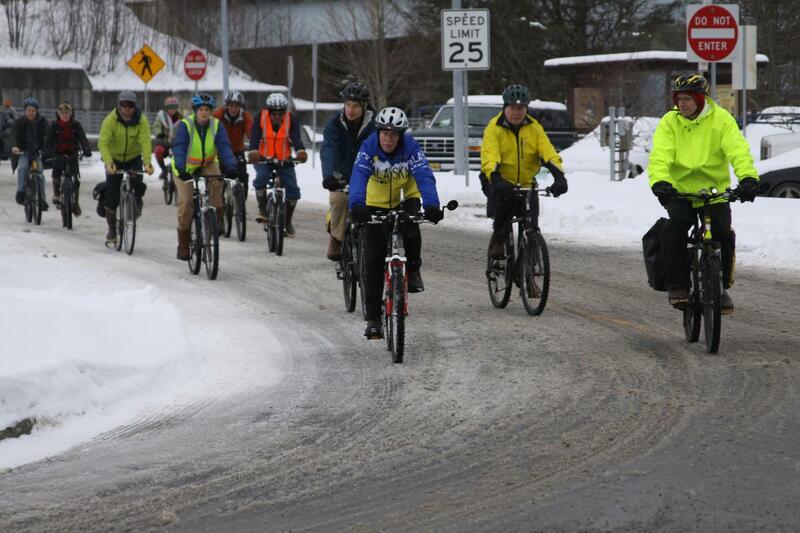 “The involvement of the Sitka Health Summit increased awareness of the need for promoting bicycle safety, both for the riders and the vehicles. Anyone known as a community leader can exemplify good riding habits that will have a positive impact on the community. When Sitka first applied for a Bicycle Friendly Community designation, it had the highest percentage of bicycle commuters in the state at 2.79 percent. Since then, the percentage of people who commute to work by bike has risen to 5.42 percent, nearly doubling in just eight years. Being in a rainforest, Sitka has built several covered bike shelters for larger businesses, helping to protect bikes from the rain. The Coalition also launched a safety campaign that included radio PSAs about sharing the road and being visible and predictable while riding, and a newspaper insert with rules of the road for cyclists on one side and rules of the road for drivers on the other. The Coalition works with other community groups to plan several bicycle events during National Bike Month, such as an annual Sitka Bike Rodeo hosted by the Rotary Club of Sitka and U.S. Coast Guard Air Station Sitka, a triathlon hosted by the Baranof Barracudas Swim Club, a National Bike to Work Week event (with prize drawings from Yellow Jersey Cycle Shop) and Bike to Work Day event (sometimes with breakfast at the University of Alaska Southeast Sitka Campus or lunch at the Larkspur Café) and a community bike ride. 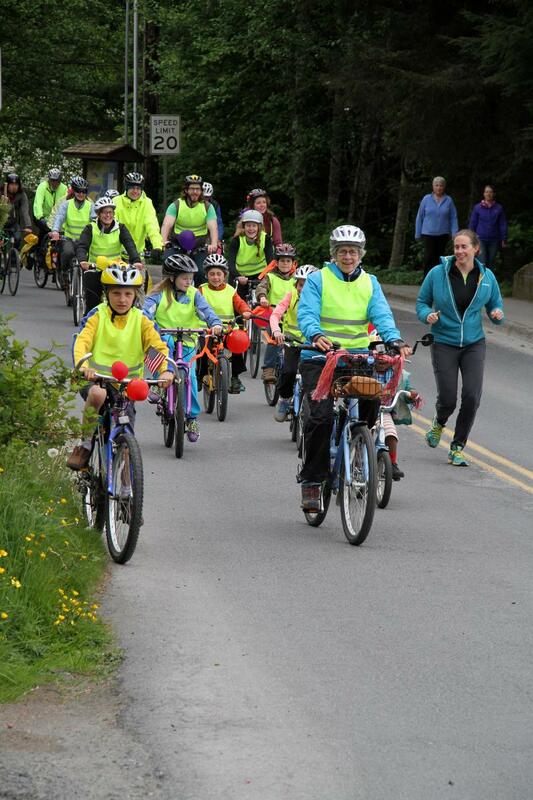 Sitka also hosts a Kidical Mass youth bike ride event in September, an International Winter Bike To Work Day event in February, and various bike safety and maintenance education events. In addition, Sitka passed a youth bike helmet ordinance in 2005 and a cellphone ban while driving in 2016. The City and Borough of Sitka covers more than 4,000 square miles (the largest city limits in the country), but most of Sitka can be found in an area of about 16 miles of coastal road with a connecting bridge to Japonski Island where Sitka’s airport, university, Coast Guard station, a hospital and a high school are located. Being on Baranof Island, Sitka is only accessible by boat or plane, and there are no highways connecting it with other communities. In recent years, the Alaska Department of Transportation and Public Facilities repaved Sitka’s two main roads (Halibut Point Road and Sawmill Creek Road), adding wide shoulders or adjacent multi-use pathways. The trail system has seen similar improvements, especially the Cross Trail which allows cyclists and hikers to go from one end of town to the other with minimal encounters with traffic. None of Sitka’s roads has a speed limit higher than 45 mph, and most roads are closer to 25 mph. Sometimes the danger isn’t cars, but coastal brown bears (some cyclists riding away from the downtown area carry pepper spray in case of bears). A former journalist and current editorial and media/PR services freelancer, Charles Bingham is a community volunteer who serves on the Sitka Bicycle Friendly Community Coalition and maintains the Coalition’s website, http://sitkacycling.wordpress.com/. He wrote Sitka’s two renewal Bicycle Friendly Community applications, a Bicycle Friendly Business application for the SouthEast Alaska Regional Health Consortium (SEARHC) and Sitka’s Walk Friendly Communities application.